Modeled after UML Distilled, Martin Fowler’s international best-seller, NoSQL Distilled is the definitive introduction to today’s breakthrough NoSQL databases. Together, Fowler and ThoughtWorks principal consultant Pramod Sadalage thoroughly explain how NoSQL databases work, and why they may often be a superior alternative for Big Data, high-traffic web sites, heavy-duty streaming media delivery, and other demanding environments. Drawing on their leading-edge design and implementation experience, Fowler and Sadalage guide you through choosing the right data store, successfully implementing it, and achieving maximum performance and scalability. 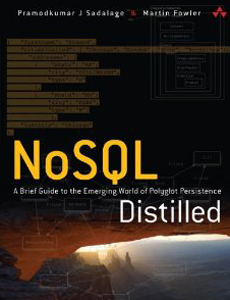 NoSQL Distilled starts by illuminating crucial NoSQL concepts and techniques, including schema-less data models, aggregates, new distribution options, and map-reduce. The authors succinctly explore architectural and design issues associated with implementing NoSQL, and offer realistic use cases. Next, they demonstrate real NoSQL databases at work through four representative examples: Riak, MongoDB, Cassandra, and Neo4j.